Footwork is the foundation of good bowling. It affects timing, balance, rhythm, direction, ball speed, and, through all of the things it directly affects, the ability to release the ball with power, accuracy, and consistency. Like two dancers who glide through their routine with grace and rhythm, the bowler and the bowling ball must be as one as they reach the foul line and the point of release. Before we get into the complex relationship between the feet and the ball, let’s take a look at the individual elements that make up footwork: the length of the entire approach, the length of the steps, the direction of the approach, the direction of the steps, and the rhythm or tempo of the entire approach. I’ll be referring to a righthanded bowler throughout this article. From recreational leagues to professional events, you will see great variation in how far back from the foul line bowlers start their approach. The single most important thing about the overall length of the approach is that it is totally coordinated with the ball so that both get to the foul line at the same time. This is where the Dance comes into play. If the length of the approach and the entire swing motion are one with each other, then the dancers are doing the same dance. If they are different, then timing is affected and timing affects everything from balance and accuracy to the effectiveness of the release. Many bowlers believe that standing farther back on the approach is a good way to generate more ball speed. This is sometimes true, as long as the ball and the bowler reach the foul line at the same time. Not too long ago I was watching a rebroadcast of an event from last year’s PBA summer swing. Randy Pedersen pointed out that Norm Duke stands all the way back on the approach to generate ball speed, using his feet to generate momentum. What Randy neglected to mention was that Norm was taking eight steps to reach the foul line. When bowlers stand all the way back on the approach and take the normal four or five steps, it often results in the bowler reaching the line ahead of the ball (late timing) and having to muscle the ball through the downswing, resulting in decreased ball speed. The perfect length of approach varies for every bowler. The length of the steps affects overall cadence. Traditional thinking was that the steps should start out short and progressively increase in length, culminating with the slide being the longest “step.” This is still generally accepted though, in modern bowling, the second to last step, the power step, is often shorter than it was historically. The problem discussed above with bowlers standing all the way back on the approach to increase their ball speed is often accompanied by the discord caused by a huge first step as the bowler tries to create the most momentum possible by the time he gets to the foul line. An overly long first step can easily build too much momentum too quickly, resulting in late timing and a muscled armswing. Another complication can occur when the power step becomes too short, hampering the bowler’s ability to crossover this important second to last step, keeping him from adequately clearing the hip. The direction of the entire approach should result in the bowler’s slide foot ending up at the foul line on the same board it started on. This is why it is so important to line up on the approach with the same foot on which you take your final step. If, for example, a bowler lines up using his right foot and slides to the foul line with his left foot, he has no way of knowing if his approach is straight or if he has drifted in one direction or the other. Checking the finishing position of the slide foot at the foul line is why you see so many professional bowlers look down at their foot at the foul line. This is not a bad habit to develop as it will also ensure that you hold your follow through at the line (post your shot). RELATED POST: Bowling: Rớt vai có phải là một lỗi kĩ thuật? Drifting is a common problem among bowlers, yet it is one that many long-time bowlers will tell you is okay as long as it is consistent. This is true, though only within some very narrow parameters, the most important being that the amount of drift is small, a board or two, and does not change from one part of the lane to another. Common among house bowlers is drifting to the right in increasing amounts as the bowler moves left on the approach. This is an interesting anomaly as it either causes the bowler to be unable to move away from their comfort zone or the fear of moving away from it causes the bowler to walk back toward it. Regardless of the cause and effect, the increasing drift right is detrimental to the righthanded house bowler. If the bowler is walking right, he cannot stay behind the ball at the point of release without throwing the ball directly into the gutter. In an effort not to do just that, he has no choice but to come around the side of the ball early which sacrifices power at the point of release. Less common, though equally detrimental, is a large drift left. This results in a loss of ball speed since the feet going left is at cross-purposes with the direction of the intended line of the ball (to the right). Step direction has always been very important, but with modern lanes and modern bowling balls, it is crucial. I’m going to start out by talking about the slide step because the change in the slide step in modern bowling affects the direction of all of the other steps. Historically, bowlers were taught that the slide foot should end in a position where the toe was pointed in the opposite direction from the bowling hand. This made sure the shoulders were square to the foul line to allow the ball path to be parallel to the lane. Today the ball is often projected from left-to-right. In order to facilitate this, virtually every top level bowler finishes with his slide foot pointed in the direction he wants the ball to go; out toward the breakpoint, from left-to-right. The direction of the other steps serves two functions: to allow the ball to swing freely without having to come around the bowler’s body and to get the bowler into a position where the sliding step can go from left-to-right so he can project the ball out to the breakpoint. I will use a five-step approach to discuss the individual step directions, but for a four-step approach, simply ignore the comments about the first step, starting instead with the second step (the first step in a four-step approach.) Wow, that was a mouthful! The first step in a five-step approach should be very benign. It should be short, often no more than a shuffle slide, to get the approach started. It should go straight, finishing on the same board on which it started. The second step in a five-step approach is the first of two crossover steps. This means the heel of the second step is directly in front of the toe of the first step, kind of like walking a tightrope. This allows the ball side hip to clear, allowing the ball to fall directly back in the backswing, unimpeded by any part of the bowler’s body. The third step in a five-step approach again goes straight, however it is not directly in front of the second step, but a comfortable amount to the side, providing balance and stability during the approach. The fourth step in a five-step approach crosses over in front of the third step. This is the power step, as it provides the base against which the slide step starts and provides a clear path for the downswing. If we look at the overall direction of the steps taking as an example four boards between the center of the left shoe and the center of the right shoe, we can calculate that after the first crossover step, the left shoe is still on the same board. After the next step, it has moved four boards left and after the second crossover step, it is on the same board, still four boards left of where it started, leaving four boards of slide to the right in order to project the ball out to the breakpoint. In order for the feet and ball to be dancing together as perfect partners, the shoulders and hips must start in the same relative position to the foul line as they will when the ball is released. In other words, if you find that your final slide step is going four boards from left-to-right, then your shoulders and hips should be open at address to point four boards right of where you are lined up. In this way, your actual delivery will be totally coordinated with the intended line of your shot. The two crossover steps are critical to clearing the ball side hip in both the backswing and downswing. If those two steps do not crossover, the hand can have trouble staying behind the ball on the downswing. This can cause chicken-winging or coming over the top, robbing the release of power and roll. Another issue is when the first step in a five-step approach goes to the right, the beginning of a drift to the right. Finally, when the sliding foot opens up to the left, it can cause a kind of whirlybird motion, as that motion with the foot tends to want to bring the ball around the bowler’s body to get it on line. When the slide foot points along the projected path, the body feels it is already in alignment. When the direction of the steps and the direction of the approach are coordinated with the intended line of the ball, the bowler’s armswing can be free of muscle, generating the maximum amount of speed possible in the shot. When the direction of the approach goes from right-to-left and the intended line of the shot is from left-to-right as it so often is in modern bowling, the result is a loss of ball speed since the momentum of the bowler and the momentum of the ball are at cross-purposes. Conversely, when the entire approach goes from left-to-right, the result is a conflict between the direction of the feet and the intended line of the ball, forcing the hand to come over the top of the ball, resulting in a loss of power and roll. When the direction of the individual steps and the direction of the entire approach are in sync with the direction of the intended line, the result is a muscle-free shot with maximum speed and opportunity for the bowler’s hand to stay behind the ball to generate the most powerful release possible. The Dance is the synchronous rhythm between a bowler’s armswing and feet. The Dance gets the ball to the line at the same time as the feet. While there are definite dos and don’ts in the components of the footwork, the Dance is a uniquely personal thing derived from all the unique elements comprising a bowler’s style. While the timing of the pushaway that coincides with the fourth step back from the foul line is generally considered to be one of the main elements involved in creating good timing, the Dance allows the bowler to do what he needs to do to tailor his timing to his own game. Every successful bowler has his own Dance where the two partners, the feet and armswing, move in tandem to provide proper timing and leverage. The next time you watch the pros bowl on television, watch their footwork in relation to their armswing. I think you will find each bowler has their own unique footwork, but in every case, the two partners are working together to create balance, rhythm, and a powerful release. Pass it on, happy bowlers! Previous Previous post: Bowling tips: How to decrease or increase your ball speed? 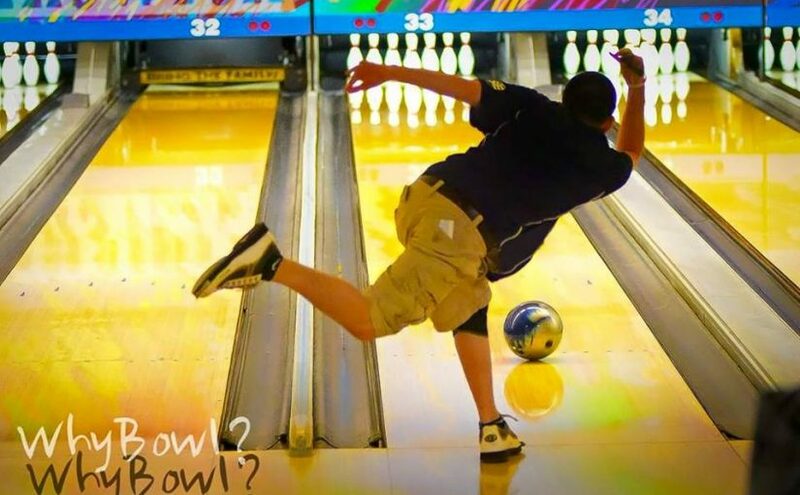 Next Next post: Bowling tips: Why you should free your arm swing when bowling?